For more almost twenty years I coveted my Scuba certification. Justifying a new hobby, especially one such as scuba diving, is impossible without including my wife. Unfortunately she was uncomfortable in the water, let alone under it. Add children to the mix and it becomes impossible right? Not so fast. I did gain my Open Water certification as did my wife, 11 year old daughter and 10 year old son. Together we gained a new way to experience the beauty of life and the sea achieving it all with Scuba Cat Diving in Phuket, Thailand. I can’t say this would have come to fruition without Sarah, and the support of the entire professional staff. My wife, Deborah and I took our children, Alexa and Connor, out of school in the U.S. and embarked on a one year trip around the world. Deborah is a professional portrait photographer and I a travel writer and filmmaker (http://www.coastlines-tanlines.com). Together we set out to create a book of fine art, which we recently published called, “Portraits of Our World” (http://www.portraitsofourworld.com). We wanted to avoid Europe and the typical destinations, instead focusing on Southern Africa, the Middle East, India, SE Asia and Australia. We home schooled each step of the way using our daily life as the laboratory. 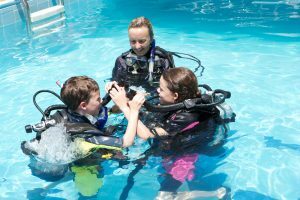 The value of the scientific education our kids received while completing the course of study at Scuba Cat Diving was unparalleled for their age. Choosing the right company to do your certification with can be daunting. We used our slow internet connection in India and were more confused then when we started. Undeterred we came up with a short list, deciding to visit each once in Phuket. Our first order of business after arriving in Phuket was to find a home to rent. This minor detail dispatched we headed into town to sign up with one of the companies on our list. We were immediately impressed with Scuba Cat Diving. The staff was welcoming, the facilities were clean, the instructors professional and they showed great willingness to certify the kids seeing them as a wonderful challenge, not a burden. "like an elephant’s skin on a mouse"
Once the pool is complete the open water work begins. One must pass a swim test in order to enter this last phase. Ours was to swim around the dive boat one time. We could no longer put off that swimming problem. Let me tell you what motivation can do for a soul. We had the good fortune to rent a very nice home while living in Phuket, one with a large pool. Every day after dive school, the kids would practice swimming in this pool. When the big day came to swim around the dive boat they did with no problem. My kids were ecstatic, my wife and I proud and Sarah relieved (that all her hard work had not been for naught). The remainder of the dive course went without a hitch and the whole family gained their qualifications. The kids were limited to depth for a few years thereafter due to their age but every operator we dove with honored their credentials. I was so impressed with Scuba Cat I personally continued on to get my Advanced Open Water, Deep Diver Specialty, Wreck Diver and Enriched Air Specialty. The only reason I did not gain more education was that my time in Phuket had come to an end. 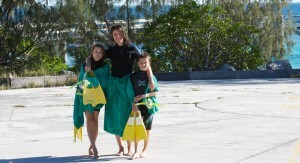 Since their training Connor and Alexa have had the great fortune to dive on The Great Barrier Reef near Herron Island. They also got their first night dive in Kona, Hawaii watching manta rays swoop over their heads. The ray’s mouths were bigger than the kids. Most recently they dove near Coiba Island in Panama, which is the northern most island in the Galapagos chain. We are quite proud of our children’s accomplishments and experiences diving. None of which would have been possible without the professional attention of Scuba Cat and most especially Sarah. I recommend that if you are looking to learn to dive, refresh your skills or increase your certification you do it with Scuba Cat. All I ask is when you are done diving for the day, you lift a cold Singha and mention me in a toast. 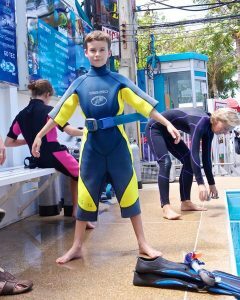 This entry was posted on Friday, July 22nd, 2011 at 12:05 pm	and is filed under Dives, Diving for the family, Junior Open Water, New Divers, Scuba Courses. You can follow any responses to this entry through the RSS 2.0 feed. Responses are currently closed, but you can trackback from your own site.